Perhaps it's only a coincidence that on this April Fool's Day, Google has announced an extraordinary initiative to improve your e-mail experience. 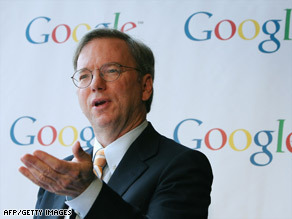 Eric Schmidt, chairman and CEO of Google, which unleashed its annual April Fools initiatives today. With Custom Time, you can change the time stamps on up to ten e-mails per year to make it look like you didn’t miss deadlines, birthdays, anniversaries, etc. But wait! If you make it so that an e-mail was sent in the past, wouldn't that have affected subsequent events? Apparently Google can even smooth out related kinks with its "e-flux capacitor" to "resolve issues of causality." One user apparently told Google, "I used to be an honest person; but now I don't have to be." Even more exciting, Google claims to have teamed up with Virgin Group to launch Virgle, the first human colony on Mars. You can even apply to join the venture by answering the questionnaire. You'd better think really hard about how you would respond in tough situations. What would you do if "unexpectedly confronted with the emergence of a bewilderingly alien and frighteningly advanced Martian life form" that "appeared bent on killing" you if you "failed to quickly and effectively communicate my peaceful intentions and potential value to its civilization"? Once you've got that down, submit a 30-second video through YouTube explaining why you want to live on Mars. It's just that simple, fool. Eric, how about making Google permanently black with white text. The white screen glare hurts people's eyes and uses too much energy. You hit on something in Earth hour last weekend. How about black Google or at least make it an option. Thanks. I was very upset when I read about the new feature.....it really shook me up, I thought "what is this world coming to!!!" Only today did I learn it was an April Fools joke....thank goodness it is. What is still up setting is comments I read about some people thinking it would be "awsome". Scary values. @Mr. Spock: Actually, as Black takes more energy than white to display on LCD screens, unlike CRT screens. So, if you have a LCD screen, go with white backgrounds. Hey Spock. Google already did a blackout hour on March 29th, 2008. Dave thanks for the tip. It was in tools/colors. Still trying to learn the little subtleties of Vista. Have a colony on mars? Just like on star trek, eh Mr. Spock? Yay for google! At the rate we're going, it will be just orbiters and robots on Mars. No astronauts, and no colonies. I'm afraid we're stuck here, Kirk. Dammit Spock! Where's your compassion! Keep the display white you pointy eared, Vulcan moron. I find your line of reasoning highly illogical, Doctor. Why would anyone want to live on Mars? It's cold, dusty, dry, bathed in harmful UV radiation, and has a poisonous CO2 atmosphere that is very thin. Quite a deal of artificial domed colonies at great expense, and some degree of terraforming would have to take place before anyone would consider living there. A great place for astro-science to be studied, but not a very nice place to live. We have it pretty good here on the big blue marble.